Cottrell Laurence Dellums, also known as C.L. Dellums, was a prominent African American trade union activist, and uncle and role model to Congressman Ron Dellums. C.L Dellums was born in Corsicana, Texas on January 3, 1900. He moved to the San Francisco Bay Area when he was a young man to escape racial and economic discrimination in the South. Dellums came to California with the hopes of attending law school, but when he arrived in Oakland at 23, Dellums dreams were crushed, as the opportunities available for African Americans were extremely limited. Black workers in the Bay Area did not have a choice when it came to their professions. African Americans, if employed at all, were either janitors, waiters, shipyard workers, or porters. Unable to afford law school due to low wages of these jobs, Dellums began work as a Pullman porter. In the 1920s, almost all the sleeping car porters who worked on the trains were black, while every supervisor was white. Because of this, black workers like Dellums were making $2 an hour, barely enough to survive. 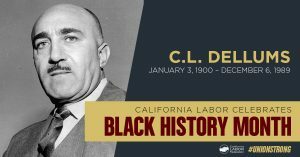 Fed up with low pay and poor working conditions, Dellums joined the Brotherhood of Sleeping Car Porters, the first black labor union, headed by labor leader A. Philip Randolph. When the Pullman Company found out Dellums joined the union, he was fired immediately. Luckily, the brotherhood hired Dellums as a full-time union organizer, and was eventually named West Coast vice-president by Randolph. After years of organizing and mobilizing, Dellums helped the Brotherhood win a collective bargaining agreement with the Pullman Company in 1937. In addition to Dellums time as a union organizer, he was also instrumental in the civil rights movement. Dellums served as the regional director of the NAACP and was one of the key organizers for the March on Washington. Dellums continued the fight for equal rights and equal protections for black workers by leading the statewide movement for a state fair employment practices law. Because of his efforts, Governor Pat Brown appointed Dellums as the chairman of the Fair Employment Practices Committee, making him the first black man to ever hold the seat. Dellums ended his career as the International President of the Brotherhood of Sleeping Car Porters, succeeding A. Philip Randolph. Dellums was laid to rest in Oakland on December 6, 1989, but his legacy lives on. A building near the African American Museum and Library of Oakland is named for him, and a statue of him stands at the Jack London Square Amtrak station. Most notably, is the C.L. Dellums African American Leadership school, whose goal is to train union and community members active in the black community so they can strengthen relationships between the black community and the labor movement. In the spirit of C.L. Dellums , we need to continue to mobilize and fight to protect ALL workers, especially our most vulnerable brothers and sisters. Our country is facing a resurgence of bigotry and white supremacy, and it is up to us to follow Dellums’ commitment to both racial justice and economic equality. We honor Bay Area hero C.L. Dellums by continuing the good fight for a more just, inclusive and equitable labor movement, and world.